The ZWP10 remote control enables radio control of electrical accessories which are compatible with the Z-Wave communication system. The remote control can be used to operate up to 10 receivers individually and up to 231 receivers in groups. The ZWP15 remote control enables radio control of electrical acsessories which are compatible with the Z-Wave communication system. The remote control can be used to operate up to 15 receivers individually and up to 231 receivers in groups. The ZWPSA4 remote control is designed to operate AMZ Solar, VMZ Solar awning blinds and VMB Solar markizoleta. The remote control can be used to operate 4 awning blinds individually or 4 awning blinds simultaneously. 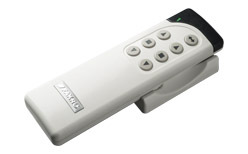 The ZWPS3 remote control is older version of the controller designed to operate ARZ Solar roller shutters. The remote control can be used to operate 3 roller shutters individually or 3 roller shutters simultaneously. 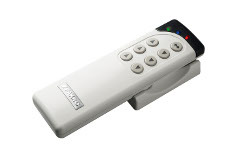 The ZWPS8 remote control is designed to operate ARZ Solar roller shutters. The remote control can be used to operate up to 8 roller shutters individually and two groups of 4 awning blinds simultaneously.